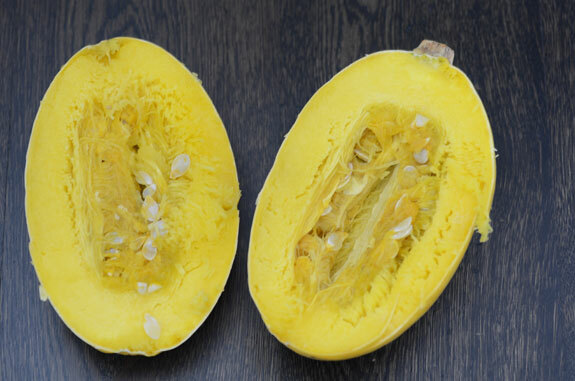 Spaghetti squash is an oval-shaped, hard winter squash. When cooked the flesh turns into spaghetti-like strands that make a wonderful paleo substitute for pasta. The catch? Once you bring that golden gourd home, you’re left wondering how to cook spaghetti squash. Thankfully, it’s easy. When you make spaghetti squash noodles you don’t need a spiralizer or any other fancy kitchen gadgets. There are several simple ways to cook spaghetti squash. It can be cut into sections and steamed on the stove, or you can learn how to cook spaghetti squash in the oven. Cooking a whole, uncut spaghetti squash in the oven avoids the process of wielding a huge knife and stabbing at a giant hard squash. After it’s cooked, you can cut through the tender flesh easily and safely. The other benefit of this cooking method? When the flesh is sealed inside the squash it retains flavor and moisture. Looking for healthy paleo noodles? Look no further. Your pasta dreams are about to come true! After the spaghetti squash is cooked, allow it to cool and then slice it in half. 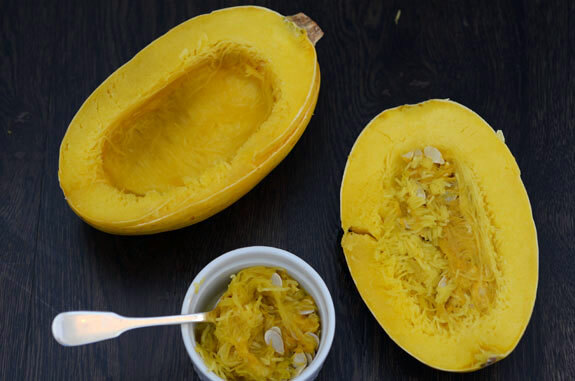 Scoop the seeds out of the spaghetti squash. 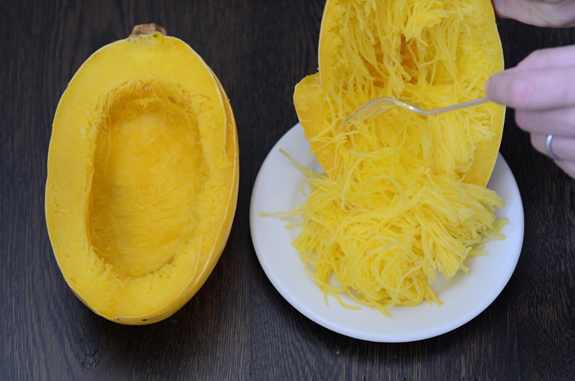 After the seeds are out, scoop the spaghetti squash noodles into a dish. I make spaghetti squash noodles for myself whenever the rest of the family is eating packaged gluten-free noodles. If you like healthy spaghetti squash noodles, you’ll love my post called, Paleo Pasta: Healthy Low-Carb Swaps for Noodles, which features other healthy vegetable noodles along with their carb counts. Vegetable noodles are wonderful pasta substitute for those following a Ketogenic Diet. I often serve spaghetti squash with coconut oil and cinnamon, or with Bolognese. I also have a fabulous recipe in my latest book Paleo Cooking from Elana’s Pantry for a Paleo Pad Thai that uses spaghetti squash noodles! And you’ll definitely want to try my low-carb, keto Mac n Cheese Skillet Casserole recipe, made from spaghetti squash! My 7yo really likes spaghetti squash this way! Maybe even more than Tinkyada or Capello’s GF pastas. Thank you! (She also prefers cauli-rice to real rice. My husband and I enjoy it too! Elena-I have made 1 spaghetti squash in my life. I baked it. Scooped out the seeds. Took a fork and did the noodles part. Added my sauce. Took a bite and threw it all away. All I could taste was squash! I was told that the squash will take on the sauce taste. What did I do wrong? I am thinking I may not have scooped far enough down into the squash before doing the noodle part? Help! What about an air fryer? My suggestion is to set the oven to 400 degrees. Cut the squash in half lenthwide and remove seeds. Salt and pepper the cut sides then flip over and place face down on parchment lined cookie sheet. The squash takes anywhere from 20 to 30 minutes and if you like it crunchy as I do, test after 20 minutes with a fork..if the fork goes in fairly hard take it out of the oven. If it is really hard for the fork to go in keep testing after 5 minutes. What you DON’T want is the fork to slide in super easy for then it will be too soft. Once out of the oven, place cut side UP, and when you can handle it, shred with a fork..easy peezy! I tried another method I saw. Cut it in half and put it in a baking dish with about an inch of water. I think you could bake it, but it also said you could microwave it for about 12 minutes. It worked pretty well, but the next time I think I may try baking it or microwaving it a little longer as it was a little “crunchy” as my spaghetti pasta. Still pretty good, ‘tho. Bob, glad you liked the spaghetti squash. It’s one of our favorite vegetables! Kindly; how do I store extra spaghetti squash noodles and reheat? Shauna, After it is fully cooled, I store mine in a glass container in the fridge for up to 3 days.